While MachNation forecasts 24 billion connected IoT devices worldwide by 2025, the majority of those devices will belong to or be sold by large enterprises rather than SMBs (i.e., businesses with 499 employees or less). In fact, MachNation forecasts that only 25% of the connected devices by 2025 will belong to or be sold by SMBs. 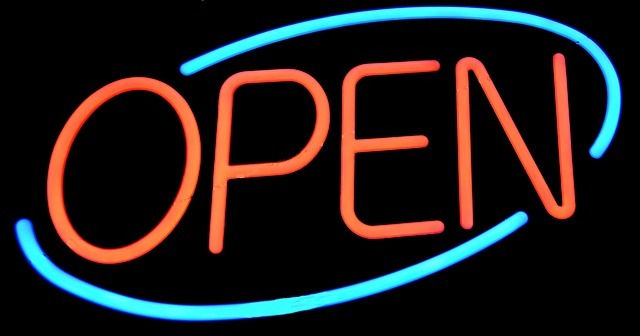 There are several reasons why IoT solutions are not being sold to or offered by SMBs today. It takes 4 to 6 vendors of IoT technology to implement one IoT solution for an enterprise. Most SMBs do not have the technology acumen nor the time to stand-up the type of custom solution that requires vendors offering hardware, software, platforms, communications and integration services. IoT proof of concepts are generally difficult to do. Most IoT proof of concepts (PoCs) require IT and operations technology staff working together to trial solutions. Most SMBs do not have the internal technology resources to engage in a series of PoCs followed by solution refinement. IoT pricing can be prohibitive. 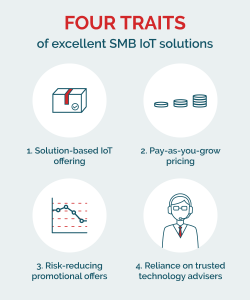 Many IoT solutions are priced outside a reasonable range for SMB customers. Some IoT solutions require fairly substantial up-front costs for hardware and services. Development of these solutions is fairly expensive with no guarantees of being deployed by the SMB. Furthermore, some IoT solutions are fairly expensive to maintain and require dedicated IT staff. MachNation analysts have identified the 4 traits that SMBs should seek from vendors of IoT solutions. We summarize those traits below. A solution-based IoT offering is most viable for SMB customers. SMBs need pre-integrated solutions that require minimal custom development. The solution should include hardware, platforms, communications and applications. MachNation often refers to this type of offering as an IoT platform-enabled solution (PES). MachNation defines an IoT PES as a solution-centric offering optimized to reduce the time to deliver a fully-enabled, end-to-end, vertical IoT solution to customers. A PES vendor relies on a product-plus-services model; an application development lifecycle managed by in-house and partner resources; and either a rapid application builder or template-based framework. PES vendors use a direct or partner-led sales model and engage a core set of systems integrators to create validated, rapid and secure industry- or application-centric IoT solutions for customers. An IoT PES vendor can act like a one-stop shop for SMB customers. Pricing models for IoT SMB solutions must be pay-as-you-grow. A traditional IoT solution comprised of hardware, platforms, communications services, applications, development services and integration services is often priced prohibitively for SMB. While some SMBs would be able to spend on a larger-scale IoT deployment with extensive up-front investment, a more appropriate pricing model for SMBs is a pay-as-you-grow model with a multi-year services contract. Vendors of IoT solutions can bundle all the technology components and base pricing on a multi-year contract. IoT solutions must come with promotional offers to reduce deployment risks. SMBs must use IoT vendors that wrap their IoT solutions in a set of services to aid in the development, testing, deployment and ongoing management of a solution. For example, SMBs should seek vendors with proof-of-concept (PoC) programs with try-before-you-buy guarantees. IoT is still a relatively new technology. SMBs should be able to use the technology in a PoC trial and then choose whether to invest for the long-term in a fully-scaled deployment. SMBs must rely on their trusted technology advisers to help procure, deploy and manage their IoT solutions. Most SMBs do not have IT departments or extensive IT staff. As such, they rely on trusted technology advisers including VARs, agents and resellers to implement and manage their IT solutions. Deployment and management of an IoT solution should be similarly sourced and supported for an SMB. SMBs should be able to use a technology adviser — preferably one they already use — to procure, deploy and manage their IoT solutions. It is an even better arrangement if those advisers have already integrated new IoT and traditional IT solutions into a common offering. SMB-ready IoT solutions is an excellent growth area for existing IT vendors, VARs, resellers, distributors and agents. MachNation recommends that these vendors consider using their existing device management and analytics platforms as a springboard for launching new IoT solutions to their existing customers. This research plus accompanying case study on Unified Office, a UC vendor offering IoT services, is available to MachNation partners of our IoT Application Enablement or IoT Device Management programs. MachNation will continue to cover the emerging trends of SMB-ready IoT solutions. For more information, please contact us.